New Discoveries, a photo by Ayala Moriel on Flickr. Monday was spent on the road mostly, doing a round trip to Seattle to reconnect with the West Coast indie perfume community, and smell some new raw materials. The fresh Szechuan pepper essence pictured here made the trip worth my while, but there were some other fascinating raw materials worth writing about. Elemodor: fraction of elemi resin, which possesses no resemblance to its origin, with only the slightest hint of resinous woody. The best way to describe it is as orange zest and juice on speed. Elemi (Canarium luzonicum): Sharp, crisp, like lemon and black pepper combined, and also with hints of both cilantro leaf and pink peppercorns. Tobacco absolute: Time and time again, I'm surprised at how muted tobacco is. It can easily disappear in a blend, and it sometimes seems as if the more you add, the less you'd smell of it. A challenging raw material to work with, but powerful and very elegant when used properly. Although it does not have a very strong odour intensity or diffusive power, it is a distinctive note, reminiscent of freshly cured tobacco leaves (read: not stale! ), fermented hay in a meadow, and with an undercurrent of animalic energy. A truly good tobacco bring a sense of reverence and reminds me of the original use of this as a sacred, medicinal plant. Please note that this absolute is nicotine free, unfortunately, so don't try this as a substitute for your nicotine patch! Cypriol/Cyperus/Nagramotha (Cyperus scariosus): from the vetiver family, this root oil possesses as urpentie, sharp top note, woodsy-dry base, and a very clean, elegant dryout reminiscent of the hint of tart freshness of Haitian vetiver. Bois des Lands or Pinewood is a co-extraction of French pine resinoid with a Virginian cedarwood oil. Smells of wood, mushroom-y forest floor, moss and a tiny smoky, with a cheese-like fermented undertones. Dries out to a woody-balsamic finish. Cedarwood fraction: From Texas cedarwood. Sharp cedar note, a little sweaty-herbaceous reminiscent of oregano. Olibanum Wood: co-distillation of olibanum (frankincense resin) with Virginia cedarwood, which creates an interesting new note that is more stable and woody, more reminiscent of dusty frankincense tears rather than the oil or the smoke. Vanilla CO2 with 20% vanillin: This is just about as sweet as one can get, in a very elegant way. Ambrette Oil (Abelmoschus moschatos): High content of ambrettolide, resulting in a typical "white must" scent without the skin-like, buttery, nutty and wine-like quality of most ambrette seed essences. Szechuan Peppercorn, Fresh: Green, floral, surprisingly citrusy (reminiscent of ruby red grapefruit, bergamot and yuzu), tomato leaf and yerbamate. Very distinct, fresh and tenacious. Poplar Buds Absolute: Honeyed, boozy, hops-like, hint of cloves, dominant propolis note, hint of nutritional yeast odour. Mimosa Olessence: Gentler extraction method, resulting in a more true to the flower profile. Reminiscent of almonds, marzipan, hints of fennel, floral, woody and clean. Elderflower Absolute: That nutritional yeast note again, with only the tiniest hint of what the fresh flowers are all about - cassis-like and floral. More like hay than a flower overall. Similar to linden blossom absolute, which also presents a similar problem. KF1150: Isolate that smells grassy green and sharp - like a combination of gasoline and freshly cut grass. Your dad is going to love this! Black Tea Absolute: Smells like a wonderful container full of fresh Assam tea, maybe hints of Darjeeling too. Eucalyptus Forte: Combination of of solvent extraction and molecular distillation. Green, balsamic, eucalyptus pods, hints of animalic/indolic quality, surprisingly. Very tenacious, resinous-woody-balsamic dryout. Just a little glimpse into where a perfumer's palette can expand. I'm pleased and excited to begin a new series on SmellyBlog, dedicated to one of my favourite notes: osmanthus. And for the first time - I will be hosting other perfumers who will share their thoughts, impressions and creative process working with this very special raw material. The idea came to me after visiting Eden Botanicals last summer with my fried perfumer Lisa Fong. We both felt that this osmanthus was so exceptional it called for some special attention. 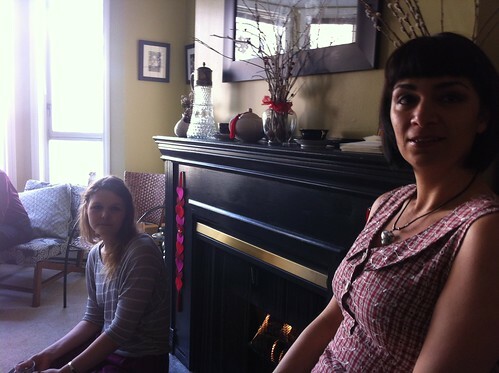 Perhaps a little perfumers conversation on SmellyBlog? We exchanged some osmanthus goodies - the dry buds, teas mixed with the dry buds, osmanthus oolong and such, and before I even knew it - September came around, and we met again at the LA Artisan Fragrance Salon and Lisa has already created a new perfume surrounding osmanthus. I was clearly behind on my osmanthus series project - in hindsight perhaps a good thing. Because meanwhile I virtually met another talented and gracious natural perfumer, Charna Ethier, and fell in love with her Osmanthus Oolong. 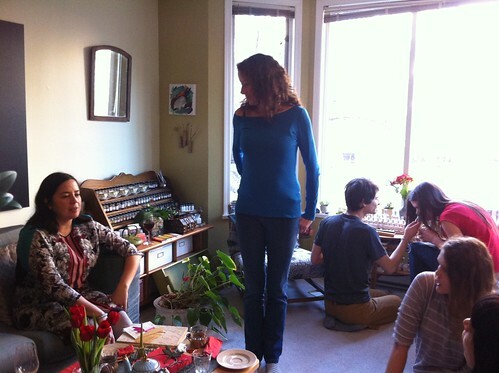 About a month later - Nikki Sherritt launched her Osmanthus Red at her Blackbird event (part of the Northwest Perfumers Circuit). It was clearly time for some action on the osmanthus front! How can I describe osmanthus to you? Osmanthus (Osmanthus fragrans), sweet olive or tea olive (as it is known in the Southern United States) is a flowering evergreen shrub or small tree from the olive and lilac family, native to warm temperate Asia. It is cultivated as a decorative plant in gardens. In China, the dried flowers are used to infuse both green tea and black tea to create a fine tea called guì huāchá. It is also used in Chinese cuisine to flavour other specialty foods such as jam, cakes, dumplings, soups and a specialty liquor. It is widely cultivated in Japan, where is it called kinmokusei, and where its incredibly humble, tiny clusters of golden-orange flowers permeate the air at the end of October, releasing a scent in the air that truly cannot be replicated. Marlen Harrison, who lived in Japan for a while, was the first to tell me of this elusive scent in real life, and how he spent hours searching for its source - so perfumey that at first he thought it was a laundry dryer sheet scent until he looked up and saw the osmanthus trees and their tiny, inconspicuous flowers. And indeed, fresh osmanthus has been largely imitated by popular shampoo brand Herbal Essence and its smell-alikes; and even some laundry detergents and dryer sheets; and only later on in Serge Lutens' Nuit de Cellophane (by which point the scent sadly lost some of its prestige). Somehow, the ethreal quality of fresh osmanthus flowers got poorly interpreted and its lush, rich beauty watered-down in the many inspid aquatic florals that took over the 90's, alongside other "Asian" themes such as water lily and bamboo. The flowers are solvent-extracted to produce a green, viscous liquid with an unusual floral note with a rich and dense aroma: fruity, leathery and green all at once and reminiscent of leather, apricots, green tea and coumarin. It is sweet, mysterious and exotic. It's fruity intensity is more pronounced in higher quality grades, while poorer quality might present a hint of rancid-oil facet. Osmanthus is a heart note that is used as the main theme or as an accessory note to add an exotic and unusual dimension to a perfume. It works very well in both rich florals and green florals, orientals, fresh fruity florals, leather and chypre compositions and can make a great floral note in a masculine scent, although it is sadly underused in this regard. Its beauty is particularly revealed when accompanied with ionone-dominated and tea-like notes (i.e. : green tea, violet leaf, linden blossom, cassie) and fruity floral notes such as jasmine, magnolia, rose and orange blossom. It's main challenge, however, is that this delicate and complex note is often cluttered with too many other dominant notes that tend to conceal it; and the other big technical challenge is that it is a little shy and tends to disappear the more you add of it. This could be in part due to the fickle character of the ionones in it. 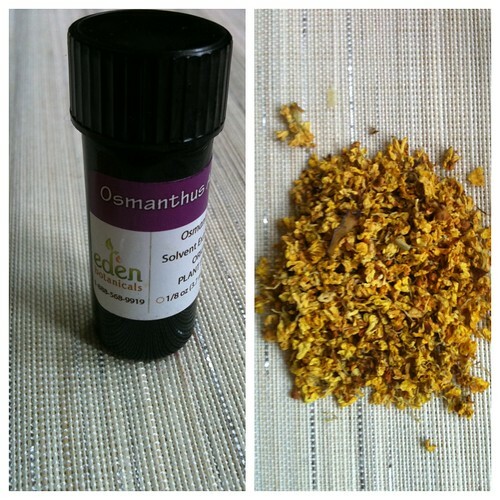 Osmanthus flowers are minuscule, and the yield is low - a classic recipe for prohibitive costs. Therefore it is not surprising that it is not a common note to find - especially not in its natural form. You'll find very few perfumes that are a true ode to osmanthus, and even they are often watered down versions of the glorious original. More often, osmanthus will come up in perfumes that are minimalist, as if to attract the potential markets in Asia (Osmanthe Yunnan and Ormonde Jayne's Osmanthus for example, where it is light, ethereal and evoking green tea and cologne); while in others it is incredibly powdery, fruity-sweet and girly (Keiko Mecheri's and The Different Company's rendition). Only rarely will a perfumer explore its darker, leathery sides, as Ineke did in Evenings Edged in Gold, where the ionone and apricot of osmanthus is paired with leathery saffron. And in even rarer cases there is an original take on osmanthus: the bitter, herbaceous rose of 1000 de Patou; and the insanely too-good-to-be-true dessert of Un Crime Exotique. And then, of course, there are the creations of the perfumers that will be part of this little osmanthus series. It will be really interesting to read their own descriptions and insights into this less-known perfume note. 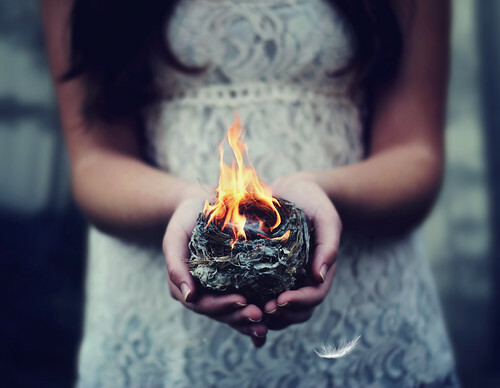 Catching Fire, a photo by AmyJanelle on Flickr. When does self-expression cross the lines and becomes kitsch? When does pathos stops moving us and becomes overbearing? An artist is always on the tightrope, finding that balance between the too-much and the too-little. A hint, a glimpse, a beginning of a smile and the words that weren't said are often more important than what shows on the screen. And sometimes a few minutes of genuine performance, truthful art can inspire you for weeks and give that "natural high"; a strong feeling of inspiration, leading to motivation, leading to the urge to express - create - do. The relationship between an artist and his "muse" is complicated only if he is too caught up in a narcissistic chase for his own reflection in the lake. True inspiration comes from life, not from being chased (sorry, Jack London, I don't agree with you!). The muse - or inspiration - is not a lover that needs to be chased or courted. It is the holy spirit that is always there, if we only let it come to us. It's not the muse who is avoiding contact - but the opposite: we are hiding from it; or worse - escaping it. But that requires patience. Not waiting for the muse; but waiting for oneself to complete the cycle. Wait for the "dry spell" to pass. Because, in truth, there was never a dry season. There was only the time for the rain to collect and condense in the clouds. And when the clouds are filled to the brim, they will pour. Just like Jonah hiding in the whale's belly, an artist might just need to hide for a while in the mundane, often times plagued by fears of impotence. Rather than fighting it, doing the hard work and fulfilling life's demands in the only cure for losing inspiration. In fact, it is the inspiration. And some more food for thought about putting our priorities in order when it comes to taking care of Mother Nature's rights. Ecuador was the first country where humans (also happen to be of American citizenship) were sued for crimes against nature. Beauty, abandon and abundance - an inspiring and thought provoking photo essay that makes us wonder if really the planet won't be much better off without us. It seems like humanity's extreme need for order actually achieves the opposite. "Treazon, an all naturals composition by Vancouver-based indie brand Ayala Moriel Parfums, unites the oboe-soft timbre and a sinister greenness with the decadence of a flower entrenched in complexity". "There's a hint of sweet floralized suede, of skin warmed by friction, of sweet spices folded into milky butter". For more delicious details - read all of Elena Vosnaki's review on Fragrantica! 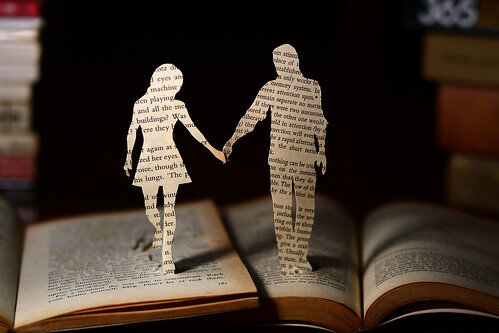 Different pages; same story., a photo by DaedaLusT on Flickr. 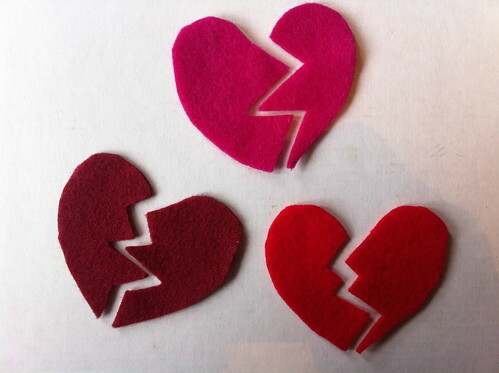 I've decided to dedicate my 4th annual Valentine's Day tea party to broken hearts - those of us who are suffering from unrequited love, or are simply lonely on this day that's supposed to be celebrated in a twosome. There is no real of art more obsessed with love, passion and desire than perfume. Nearly all perfumes are a promise of a love potion; an elixir so irresistible that it will capture your heart's desires, and lure in new ones... And some were inspired by the most tragic love stories. Others, even more so inspiring, by the perfumer's real life stories, agony and muses. Let's begin with the house of Guerlain. More than any other perfume house I know, their perfumes bottle love stories and are usually inspired by women and created first and foremost to be worn on a woman's skin. Jicky (1889) In 1864, Aimé Guerlain had to interrupt his studies in England and return to the family's business due to the illness of his father, Pierre-François. Him and his brother, Gabriel, now had to take charge of all aspects of the company - and his role was as perfumers, while his brother's was to take care of the business and marketing side of things. Years later he created this masterpiece, and although another story says this was his nickname for his nephew, Jaqcues - another story says this was the name of the lover he left behind in England. Mitsouko (1919) is inspired by the heroine of Le Bataille (The Battle) - a novel about a Japanese girl who was abandoned by an American naval officer who married her, got her pregnant and never returned to her. She tried to perform harakiri but was found by one of her maids, who saved her life. The perfume is redolent of Asian woods, spices and delicate aldehydic peach note. Félicie Vanpouille. She was a dressmaker by profession, and became Caron's legendary package and bottle designer. Her creations really completed the perfume and together the couple created masterpieces in both visual and olfactory aspects. She always turned down Daltroff's proposals, so they never married. But, she did become an equal partner and shareholder in the business, and when Daltroff fled Nazi-occupied France to Canada (he was Jewish) - he gave her the entire Caron company. He died two years later from cancer - or was it a broken heart? Shalimar (1925) was inspired by the tragic tale of Shah Jahan (an Indian king) to his favourite wife Mumtaz Mahal. She died in child birth and left him broken hearted. The perfume is named after the gardens of shalimar, where the royal lovers spent their happy times together before her untimely death. Next to them Shah Jahan build the Taj Mahal - a tomb and monument for Mumtaz Mahal. His resting place is adjacent to it, so he can watch her monumental beauty for many years. The perfume contains all the abundance of the imaginary oriental garden and is presented in a bottle that resembles a water fountain - or a fruit bowl. Take your pick. Femme (1944) was released by Marcel Rochas as a coming-of-age tribute to his wife, Hélène. It was, however, created earlier by Edmond Roudnitska, with whatever raw materials he had from a raw material supplier he worked with. The materials were inevitably aged during the war and he quality of the perfume has a certain darkness to it that truly reflects its time. Despite the gravity of the events outside, Roudnitska maintained his creative spirit and his commitment to his art. And that, to me, is the true love story behind this perfume. Chamade (1969) is the name of a particular military drum beat, and also doubles as the heartbeat of surrender - to love, of course. Jean-Paul Guerlain said he created it for a certain woman in mind - but won't reveal who she was. With notes of black currents, ylang ylang and green galbanum over a base of vanilla and oakmoss it was one of the perfumes that predicted the sharp-angled greens of the 1970's. Please leave a comment with perfumes that were inspired by a love story - tragic or otherwise. Among the commentators, there will be a lucky draw on Friday, February 22nd, to win a package with a mini of Immortelle l'Amour - my own contribution to the world of broken-heart-inspired perfumes. 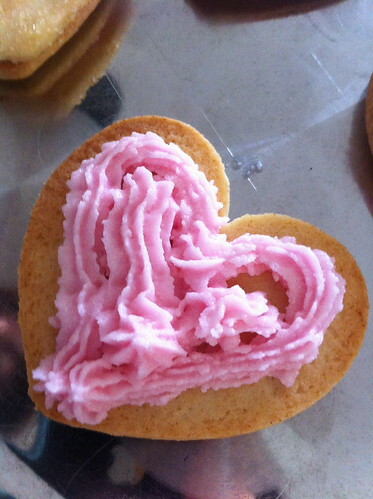 Here are some photos from my latest event on Sunday, February 10th - the 4th annual Valentine's tea party, with Broken Hearts theme... I hope you'll find some ideas for celebrating today - regardless if you're single, broken-hearted or in a loving happy relationship. By the way - the broken hearts above were part of a game. Guests had to find their "better halves" and the first two who found it won prizes! This is the setup - relaxed, casual but still luxurious, and with splashes of hearts and colours. It was an unusually small crowd because of the multiple holidays happening that weekend: Chinese New Year and Family Day long weekend - a new holiday just recently invented so that Canadian kids will get even less education than before. So, many people were away, and I will have to better plan for next year so it doesn't fall on a long weekend again. 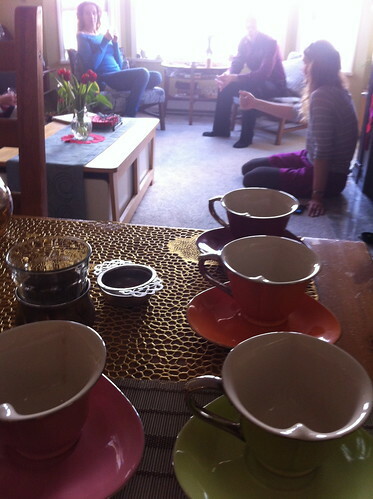 The good thing was that I got to spend quality time with my guests instead of boiling 20 liters of tea; and also considering I was sick all week I was able to sit down a relax a bit, and have civil conversations with people instead of standing up and running around for 5 hours straight (which is usually my share on my always overbooked Valentine's events). I also really enjoyed preparing for and presenting perfumes that were inspired by tragic love stories. This will be a part of a separate post though - so please visit again later today. Below are more photos and the menu as well as some recipes you can easily whip up at home tonight for your sweetie or just with a bunch of single friends that don't want to feel sorry for themselves tonight! 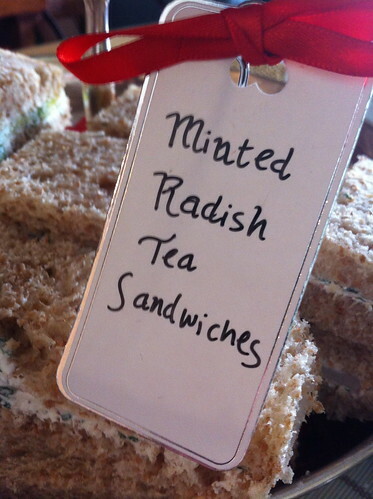 Minted radishes tea sandwiches - a surprisingly classic combination that never fails. 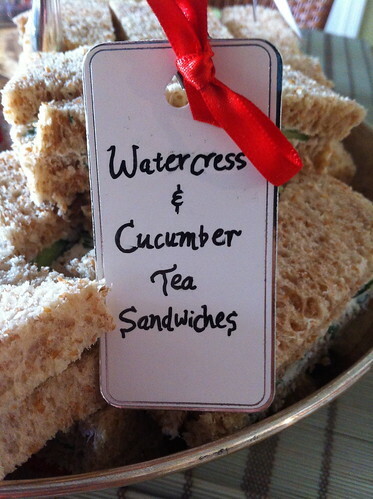 Cucumber & watercress tea sandwiches. Another classic. 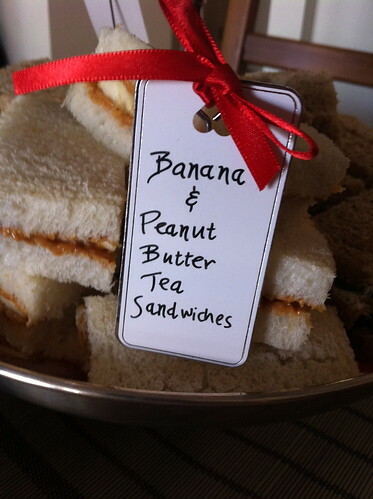 Peanut butter & banana tea sandwiches - not just for kids. Did you know that bananas are an aphorodisiac? And can you guess why? To make this flavour a tad more grown up, spread a thin layer of hot red pepper jelly on one slice, and peanut butter on the other. 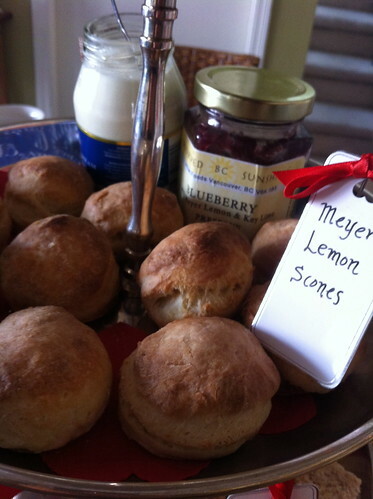 Meyer lemon scones - hot from the oven, and promptly served with Devon cream and with a blueberry & Meyer lemon marmalade. Madeleines are fantastic, shell-shaped cross between cookie and a cake. They are dense, moist yet light and are flavourful yet neutral enough to dip in a tea. 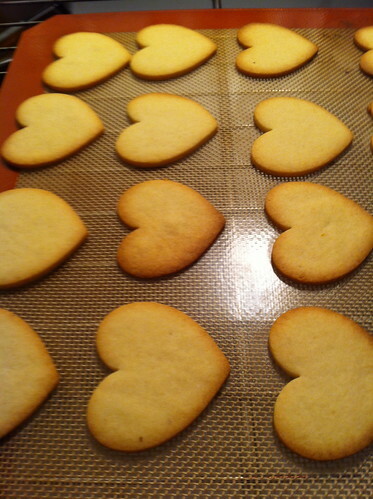 Might even be superior to shortbreads in that regard, if only it wasn't for the extra work they require. 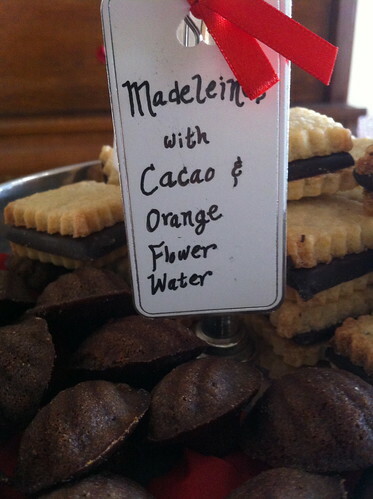 These are chocolate flavoured and are scented with orange flower water. Sounds just like the kind of recipe I will invent; but it is actually from Maxine Clark's excellent book, Chocolate: Deliciously Indulgent Recipes for Chocolate Lovers. 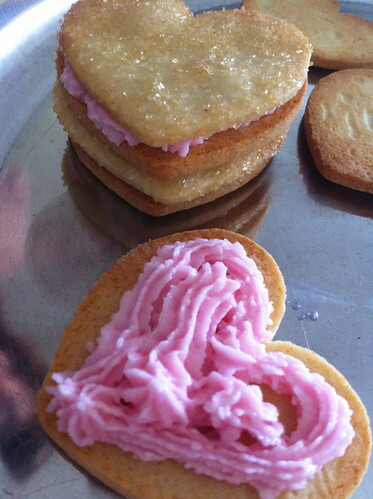 Rose almond sugar cookies with a layer of rosewater buttercream piped in between. Want the recipe? You got it! The cherry on the top, or the jewel in the crown are always the scented truffles I make for my special events and celebrations. Some were so popular that they've became a timeless chocolate bar (created in collaboration with CocoaNymph). But for the new flavours you will have to visit my studio and participate in these events. You're always sure to be surprised by an unusual, new flavour combination, featuring essential oils and tea infused ganache. This time was my first to experiment with organic ylang ylang oil of the best quality. 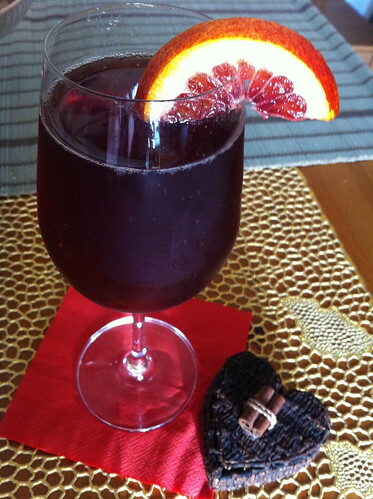 I paired it with creme de cassis liquor, a combination inspired by Chamade. The result is a melt-in-your-mouth tropical floral experience with a round berry backnote. 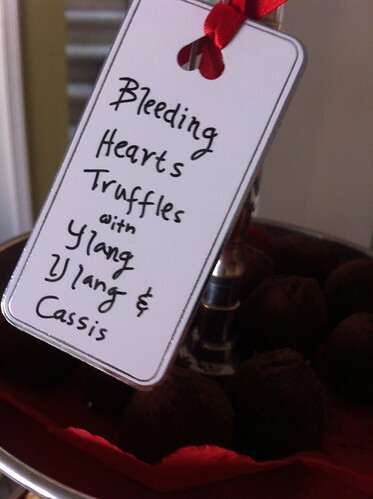 Introducing: the one and only Bleeding Hearts truffle! My lovely guests, customers & friends! I love to see everyone having good conversation and playing around with the essences and perfumes. Sometimes they don't even need my help picking a scent - they just dive in and smell them all and share their insights with their friends and other guests; and then I know that they are real fragrance lovers. 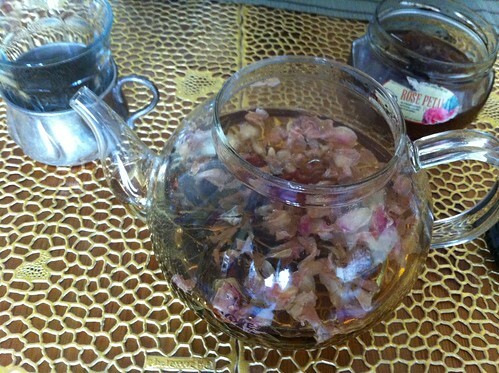 Lovers Tea: 1 hand-tied jasmine green tea + 1 teaspoon rose petals. Beautiful visual effect and ever so lovely fragrant cup of tea to sooth the soul and seduce the imagination. It's like a garden in a teapot! You might want to strain the tea before serving; but I find that letting a rose petal or to through the spout creates a more sensual tea-sipping experience. Blood Orance, sliced- Shake with ice. - Add a dash of Angostura bitters. Stir. - Garnish with a slice of blood orange. - Sip slowly, savouring every drop. - And please don't drive! Visit Feminine Things to read Diana's recommendations for Valentine's Day, including Roses et Chocolat and my new Broken Hearts Coffret! And unless you're on my mailing list, you might not know that the aphrodisiac mini trios for him and for her are back! In the last few months, I find myself constantly reaching for roses. Be it fresh, simple rosy body products, rice milk pudding with rosewater and orange flower water (otherwise known as malabi), rose chai, or full-blown romantic and mysterious rosy perfumes - I'm there. 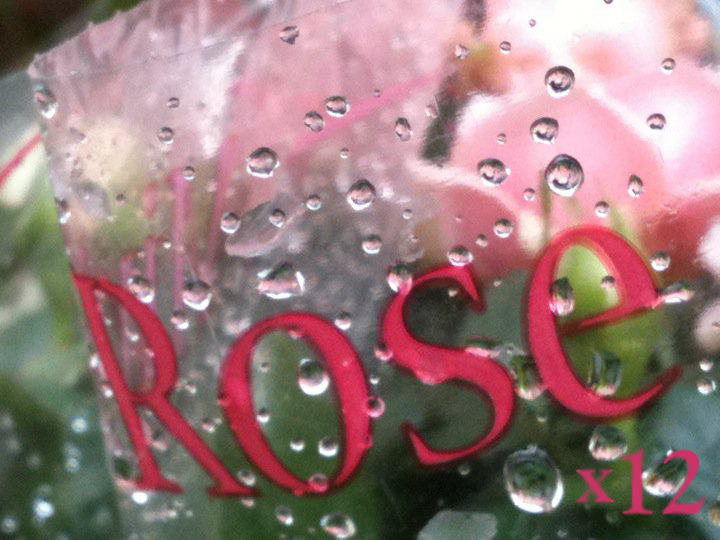 And with Valentine's Day a mere couple of month away when all this rose obsession took possession of me - I've decided to invite a few of my perfume blogging friends over for a big, rosy blogfest! 2. Nuit de Noel, also by Caron (but from a much earlier period when its founding perfumer was still alive) has all the makings of a great love story: beautiful pitch-black bottle, the enigmatic Mousse de Saxe accord which relied on isobutyl quinoline - one of the very first man-invented synthetics (aka: not naturally occurring); and more importantly: the innovation and genius of Ernest Daltroff coupled with the love of his life, Félicie Vanpouille, whose fondness of Christmas Eve is told to be the inspiration for this perfume. But what I find most inspiring is how dedicated was this couple (who never married, despite Daltroff's repeated proposals) to the art of modern perfumery in the West, which they pioneered. From the perfume design itself, where Daltroff incorporated bold, uncommon, innovative, and often difficult to work with raw materials - to the bottle and box design - these two worked together to create what I feel was authentic multi-media pieces of art. Nuit de noel is one rose that will I will always keep in its ink bottle on my desk: If I were to ever write a love letter this would be my ink. by Maurice Roucel for Rochas is a flirty, easy to wear but not as easy to forget scent. The delicacy of roses is played up here with notes of magnolia (Roucel's signature note, reappearing in many of his creations). It has such a distinct, recognizable character that is the definition of a good perfume. And it's one of the first linear compositions, abandoning the serious evolution from top to base through heart for a structure that is more in line with the fast paced modern lifestyle; yet without compromising innovation and originality. There's a lot to learn from Tocade! 4. Agent Provocateur was one of those intriguing scents - a little too much of everything. Yet somehow it just works: saffron, rose and musk - all in large doses, and although this might sound "oriental" or even with an Arabian theme - the result if one of the early Pink Chypres, also known as the hard-to-believe phenomenon "The Moss Who Wasn't There". Well, while I find such a notion to be sacrilege - perfumes such as Agent Provocateur, that do it well, do deserve respect. The musk teams up with dry, woodsy vetiver and sweaty coriander to create a bombshell, Femme Fatale fragrance that should be reserved for special occasions (example: blogging about Valentine's Day perfumes, or something more risque if you live outside the computer). 5. Kashmir Rose Whipped Body Butter by Velvet & Sweet Pea’s Purrfumery is just like they say - you have to feel it to believe it. It's like dessert for your skin. And with only the best things on earth: virgin coconut oil, cocoa and shea butters, and, of course - pure rose essence from Kashmir. Just goes to show you that mother nature does not need a lot of help to be amazing and nourishing. 6. Bedouin by Persephenie is a simple, elegant, pure rose - with a twist. But of course! Otherwise I wouldn't love it so much. And that twist is cardamom, and botanical musk from ambrette seeds. Bedouin smells luscious, fruity almost, distinctively rosy yet not nearly as boring or sharp as so many rose soliflores tend to be. "Not your garden variety", as they say... Another great example for how simpler feels more luxurious. 7. Royal Couple candle Gabriel’s Aunt is as good as it gets. And it's true, it's not all roses - there's jasmine too! Nevertheless, when it comes to candles, this is about as rosy as you can find. 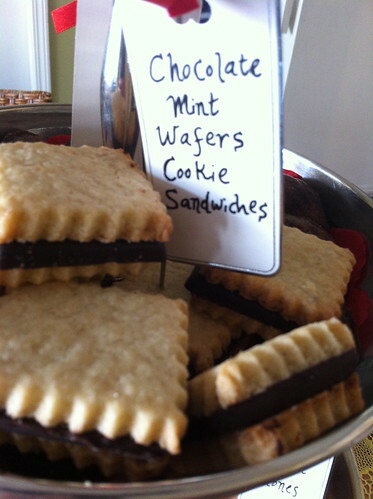 And like everything that Nikki Sherritt makes - it's all natural, and made with love. If someone were to turn Joy into a candle, this is how it would have smelled. 8. Rose Bohème by Providence Perfume Co. improves on the theme of spicy rose patchouli oriental to the point that it's really hard to say anything more than that. The key here is not just using top quality naturals (we already know that's important, right?) - but also the balancing act of making fussy notes such as rose yield to the uncompromising personality of patchouli. And to make this balancing performance even more impressive - there is also exotic saffron and stubborn cloves. Classic spicy oriental at its best. 9. Rose Paka by Persephenie is hands down the best face cream imaginable. And I say so not just because Persephenie is my friend - but because I am very picky when it comes to any products that go on my face. And they most preferably would smell of roses. Rose Paka isn't just wonderfully rosy, and redolent of white chocolate (blame it on the cocoa butter) - but it also is nourishing without being greasy; fast absorbing without being useless. I rarely re-purchase creams, as I usually find one flaw or another in them, and easily develop sensitivities around my eye areas. But this is an exception. And what's even better - it doubles as a body moisturizer, which makes travel easier! 10. I did not expect to like Rosewater & Vanilla by Jo Malone. Nor did I expect for it to remind me of anything I'm familiar with. And definitely not to smell Middle Eastern. 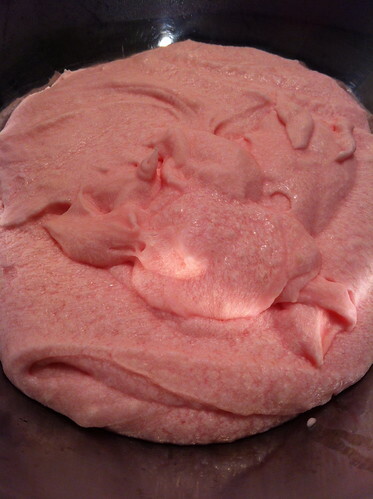 But it did remind me of malabi - that sickening, chilled dessert that is served with red grenadine syrup. But it made it smell all nostalgic, and actually very pretty. It's nice to discover new loves from time to time. And this is the only one in the "Cologne Intense" series that did not smell like it's trying too hard to smell "niche". is a Middle Eastern fantasy from a British perspective. And like all things good and British, it somehow involves floral prints - or gardens. In this case, the noble petals are embroidered with spice and desert fruit: saffron, pink pepper and dates. Somehow along the way - after you hit the drydown, you realize it's a happy medium between Parfum Sacré's spiciness and Tocade's powdery musky sweetness. 12. 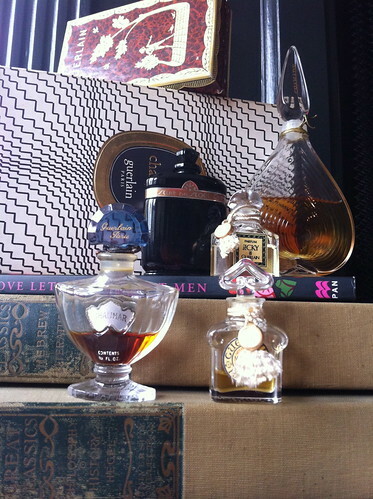 Qajar Rose by Parfums Lalun gets a notable mention for authenticity in a world that seems to have a lot of wannabes. Perfumer Maggie Mahboubian was born in Iran, and she sourced Persian roses to include in this lovely, mysterious spicy perfume, alongside saffron, cacao, coffee and wine-like fruity notes of pomegranate, strawberry furanone, davana and geranium. Parfums Lalun is an intriguing new line, inspired by Maggie Mahboubian's passion for creating her own natural beauty and cosmetic products - a tradition that was alive in Iran when she was growing up. I hope she continues to do what she does and inspires other women to live beautifully! 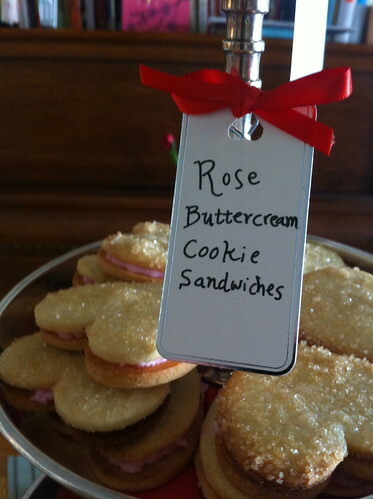 Now, I was going to share with you my new recipe for rosewater buttercream sandwich cookies which I served at my Broken Hearts Tea Party (aka my 4th Annual Valentine's Day Afternoon Tea); but I've already picked my dozen roses, so this will have to wait for another post, tomorrow. In the meantime, please scroll over to my perfume blogger friends, and get more rosy inspiration - and don't forget to leave comments with your favourite roses! Year of the Snake, a photo by Ayala Moriel on Flickr. Wishing all my reader celebrating the New Lunar Year an abundant year of positive transformation. May we all be able to shed our old skins and emerge through it with a new outlook for life and renewing the life force on this planet. Sick & Chic, a photo by Ayala Moriel on Flickr. I've been struggling with a cold since Sunday, and been trying to keep my cool about it and not feel too sorry for myself (probably the worst part of being ill). That's how I came up with the idea of Sick & Chic - maintaining your dignity through illness. Of course this is not an easy task when you’re as sick as a dog and can’t even get out of bed. And I don't know that it would be effective or relevant for someone suffering from a serious condition. Nevertheless, just like in healthy living - it’s those little details that make the not-quite-pleasant experience just a little more bearable and ever so slightly less depressing. Instead of drowning in used tissue, surrounded by empty mugs and 80’s workout attire (I'll be the first to admit that the ugliest clothing tend to be the most comfortable) -- bring out your finest china to drink that medicinal brew, your coziest sweater (or sweater dress), up-cycled cashmere underwear and mukluks and try to be a little bit more glamorously ill... I guarantee it will lift your spirits up. At least a little. And after the spirit, the body will follow - slowly but surely. 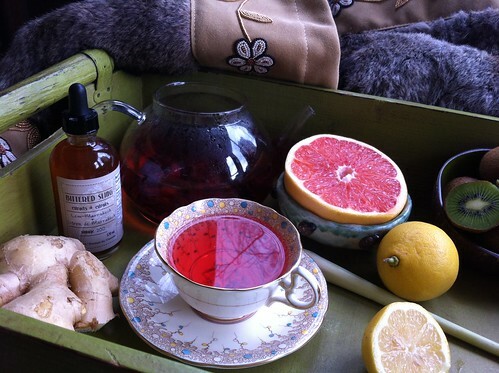 Fir needle tip tea, which was the aboriginal’s only source of vitamin C throughout the winter months. It has a delicate citrus taste, reminiscent of mandarin oranges. Harvest the new growth needles in the springtime and dry for later use; or purchase from Juniper Ridge. Another wonderful source of vitamin C is hibiscus flower tea (aka Jamaica), Besides, its ruby-red jewel tones are another reason to bring a smile to one's face. Brew it alone or throw in a few slices of fresh ginger or even a few blueberries (frozen will do) to enhance the flavour and amp up the medicinal properties (ginger is a great warming and anti-microbial brew that's wonderful for chest colds). If hot water and lemon is your thing, why not spice it up a bit with Bittered Sling Lem-Marrakech? Reminiscent of Moroccan pickled lemon and cardamom, it's sure to add some intrigue to your run of the mill lemon and hot water remedy. Besides, it's got the beneficial "side effects" of relieving fever. Feeling extra glamorous - and your nose is not 100% plugged and useless? A little perfume won't hurt to lift up your spirits. This is the time for those otherwise in-your-face spicy orientals: they won't feel nearly as overpowering as before (though you still should be careful of overdosing, in case you are surrounded by humans whose noses are not as plugged as yours). Opium, Tabu, Youth Dew - the time is now! And what with their slightly medicinal air of all those oriental spices and patchouli, medicine chests and the Chinese clinic are not an unpleasant association. Not surprisingly, I'm partial to my Zangvil, which I created exactly when I was feeling cold and sick. It never fails from bringing that feeling of coziness and well-being and just warms me up, with magnolia lily, ginger lily and ginger. Speaking of ginger lily - it is a rather unusual note that shares some characteristics with ginger root: effervescence, complexity, warmth and sensuality. It started showing up in perfumes such as Dark Amber & Ginger Lily, where it disappears in a blink of an eye and gives way to sheer amber and woodsy musks. In Providence Perfume Co's Ginger Lily, this note is paired with rather bold spices - clove and cinnamon - to create a modern spicy oriental that is all-natural and seductive. But also perfect for those under-the-weather days, when you're not sure if you want a medicine or a perfume. If your cold has reached the point of needing to steam with eucalyptus or camphor - try a dab of 1000 by Patou, or better yet - Shiso by Aftelier will make you feel glamorous about it. After all, borneol camphor is what the geishas used to scent their kimonos with; and their milky white skins were adorned with a powdered form of incense containing camphor, cassia, sandalwood, agarwood and other sweet spices and herbs. Chinatown is one of those powerhouse modern fruity chypres, where more is less (so you might not be as overwhelmed by it when you have a cold!). It also has an unusual concoction of spicy medicinal notes reminiscent of the TCM's clinic, where powdered Don Quai permeates the air, numbing pain an bringing up memories - alongside many other sickeningly bitter herbs. Mitsouko is another go-to-favourite when things don't go quite so well. It has proven to withstand the test of time (read: bad memories) and even though I was wearing it during a very traumatic time when my daughter was hospitalized - I still enjoy it very much. It's one of those friends that will never leave you, even when all hell breaks lose. It's that good. Besides, it is so perfectly balanced - dry yet sweet, fruity yet spicy, warm yet clean and elegant - that it never fails. What do you wear when you're feeling ill? 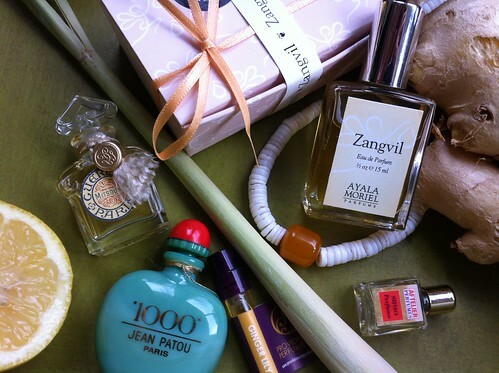 Do you just go au-naturelle - or do some scents seem to help you get out of it? Red Cedar, 400yrs old, a photo by Ayala Moriel on Flickr. My immediate attraction when starting to work on the beard oil was to use red cedarwood. It's an oil that just recently showed up in suppliers' catalogues. It's a little sad, as it is a by-product of the logging industry. On one hand - a great thing that even the sawdust is being used; but on the other hand, old trees like these should not be logged. "Western Red Cedars drink five bathtubs of water per day to survive. Their natural oils repel insects and act as a natural preservative for the wood, even after the tree dies". 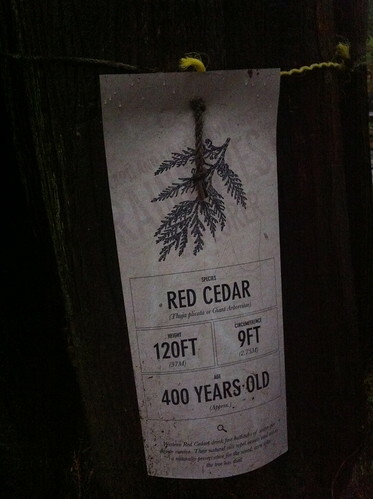 Western Red Cedarwood is not truly a cedar. Thuja plicata also has synonyms of Pacific redcedar, giant arborvitae or western arborvitae (meaning: tree of life), or shinglewood (it is used to make shingles). It is actually a thuja, which is from the cypress family. True cedar would come from the genus Cedrus, such as the Lebanese cedars, and those of the Himalayan and Atlas mountains. The scent is much stronger, potent and even harsher than that of the Virginian cedarwoods. In any case, they do all resemble pencil shavings. But the redcedar also has hints of cherry (if you have a wild imagination). It is not an easy raw material to work with because once you put a little bit, it is more noticeable than desired. Virginia cedarwood is so much more tame and well-behaved in comparison! It's also difficult to get away from the "moth repelent" association of cedar, as it is used in such way in sustainable housecare products. You can use cedar blocks or even cedar balls in place of the toxic and stinky moth balls! The indigenous people of North America, from Oregon and all the way up north to Alaska, have used redcedars in many ways for building, transportation and clothing. Redcedar is very soft and easily carved into canoes. 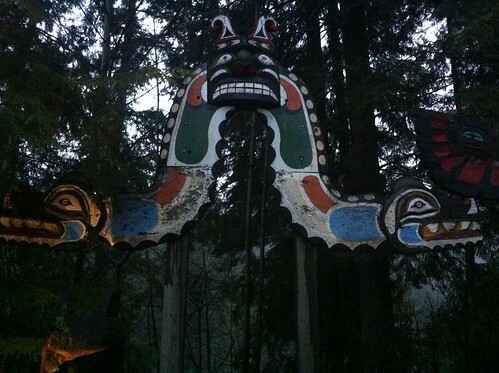 Ceremonial objects such as masks are also made of recedar, and so are most of the totem poles. Thanks to their decay-repelling oils, last many decades, preserving these people's culture, and even some archeological finds showed aboriginal tools and other ceremonial objects from thousands of years ago. Bark of redcedar is also used for making rings and even clothing, and the roots are woven into baskets. The medicinal properties of redcedar are unknown to me at this point. The other so-called "cedars" in North America are in fact junipers: Virginia cedarwood (Juniperus virginiana) and Texas cedarwood (Juniperus ashei). It might not be completely safe to guess that because of their similar smells they would have similar aromatherapeutic properties. If that is the case, I would stay away from this oil if you're pregnant (these are known abortifacients). Strong antiseptic qualities are highly probable, and also stimulate the circulation and help prevent dandruff, greasy hair, acne and oily skin. So all in all looks like an oil with the perfect specifications for beard-care. The insect, fungi and bacteria repellent properties are self-evident with how well the wood is preserved even in the most moist environment as the rainforest of the West Coast. For its antiseptic qualities, I think it would be most appropriate for a beard oil, and also for creating a feeling of cleanliness even without shaving and applying aftershave etc. But clean in a foresty way, of course. "Treazon (...) is a dark glamorous white floral fragrance that really transforms on the skin"
From wandering in the forests of the Northwest to the jungles of tangled thoughts in my mind, I came up with a new idea. 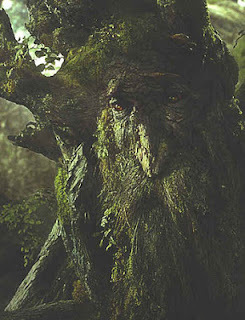 Something for an entirely different kind of forest: the one that some folks decide to grow on their faces. In the meantime, 75% of the dearest men in my life (read: brothers) have decided to let go of their civilized look and let those wild whiskers grow all over their face, concealing their otherwise very handsome features. Thankfully their eyes are still there shining ever so brightly with religious zeal, and you can sorta make out their smiles too. Phew. So, making peace with my demons (and with my brothers' rapidly growing beards), developing a beard oil seems like a healthy course of action. It's amazing that my therapist hasn't thought about it earlier. And maybe it will also catch on to the increasingly bearded culture that's prominent on the West Coast. If you're growing a beard, you might as well keep it healthy and shiny and soft. Plus, now that you put all the manufacturers of razors, shaving creams and aftershaves out of business - you must contribute to the economy with a modified form of consumerism! Beard oils are designed to take care of both the beard and the skin underneath it. Avoiding phenomenons such as bristly coarse hair, red blotches, flaky skin, and ingrown hairs. That's where beard oil can be useful: hair conditioner won't do the job for softening the hair, plus skin of the face is much more delicate and thin than the scalp. Beard oils are an easy, all-natural solution for conditioning and softening the hair while moisturizing the skin and keeping both healthy. Fast absorbing oils that are rich in vitamins and anti-oxidants and have emollient properties are the best: avocado oil, olive oil, grapeseed oil, sunflower oil, apricot kernel oil, sesame oil and the more expensive jojoba and argan oil. Essential oils that are beneficial for beard care are those which promote healthy growth of hair, while keeping the skin clean and balanced (i.e. : not too greasy, not too dry) and also take care of potneital in grown hairs in the growing-out phase: rosemary, lavender, cypress, lemon, and thyme (ct. linalol), rose geranium and cedarwood. With that list of beneficial oils, and with my recent obsession with the forest - is it at all surprising that my first attempt at a beard oil formulation is redolent of the woods? It is now already at the testing phases, with 10 samples shipped out to beard-growing test subjects representing equally the hipster persuation and the Jewish faith, with a couple of just plain old bear lovers thrown in for good measure. The first feedback just came in by means of a phone call from an excited lady whose partner has been wearing it over the weekend to much satisfaction of both parties. Both report that it doesn't only work well, but also smells good! If you like (or grow) a beard, I'd love to hear your ideas of how you'd like it to smell. And if you don't like a beard, I'd still like to hear your opinions too. If you have a beard and would like to be my test bunny please send me a private message. The beard oil will be released sometime in June for Father's Day. Luca Turin continues to work on proving his theory that the human ability to identify tens of thousands of molecule relies on their vibrations, not their shape. Is he right, or is he just chasing unicorns? Only time and more experiments will tell. Woodsy Disharmony, a photo by Ayala Moriel on Flickr. If you lasted as a reader till the end of this week - then I hope you have felt a bit of the difficulties and demands of the creative process. Not limited to perfume creation is the pre-existing feeling of restlessness, discontent and even a sense of misery. Something might be missing. Or disturbing my peace. Shaking my existence to the core. Or otherwise - fills my heart with so much joy that it is not possible to contain and has to spill elsewhere, be shared in a more appropriate way then hugging every stranger on the street or jumping up and down at the tip of a hat. It's the initial sense of imbalance, disharmony, that initiates or triggers the creative process. It's not coincidental that artists are ever so often walking a fine line between madness and sanity. Over-sensitivity or attention to beauty can be quite distracting, or even destructive. And the inability of one's heart to stay numb or blind to suffering and injustice can be maddening. 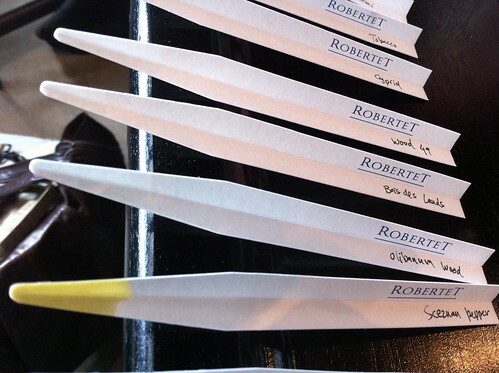 I was asked several times to comment on the role of perfumery as an art. And I usually decline committing to such definitions. For several reasons but primarily because of a certain ambivalent gut feeling I have with over-exalting my profession and work. Perfumery as an art is not nearly as accessible as other art forms, because of expense, distribution, life shelf and other technicalities. It is consumed like a commodity, and while it taps deeply into one's psyche - it's the one art form that, in my humble opinion, only becomes art once it is treated as such by the "audience" - the person wearing it or experiencing it. Unlike a melody or a painting, a story or a poem, it requires a lot more points of references to be appreciated as art, and not just as part of the surrounding. A perfume's meaning really does not come into existence until the wearer or the smeller gives it meaning: association with certain events, emotions, people or memories. Not to mention coming to contact with the skin or the medium it's meant to be carried out in or dispersed through. Additionally, perfume on many levels is like a drug or a medicine that acts deeply on our psyche. Call me self-prescribing, self-proclaimed and appointed doctor of my own soul. And let those who are interested in my little pharmacy explore and and experiment with my wild cocktails. My greatest challenge in recent years has been staying true to my creative or so-called artistic voice. Not to mention maintaining a viable business while I'm at it. To say that I'm sick and tired of the perfume industry is an understatement. The non-stop pressure to churn up new, meaningless scents is pointless and insulting to consumer's intelligence as The Non Blonde likes to remind us from time to time. This only degrades the "art" of perfumery and reflects negatively at whatever art is left in this field. It's politics are exhausting. It's intricate schemes of control and regulations against natural raw material while the rest of the world is releasing pollution and toxins into the air, earth and water make zero sense. I have made it my mission for this year to not release a new perfume. It won't stop me from being creative with scents or invent new things in my lab. But it has to be at my own pace. It has to go through a certain process that no PR agency or tight deadline can force into a set form. Now let's see if my business can survive. 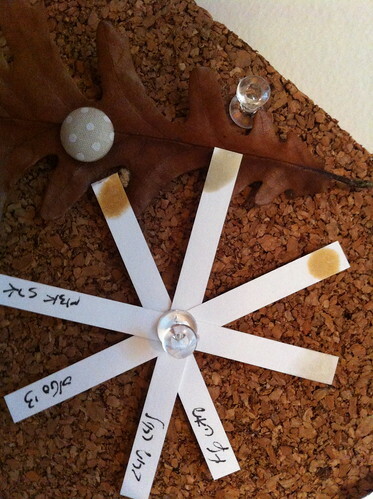 In the picture: scent strips on my little bulletin board at my lab, dabbed with fire tree, cistus, red cedarwood and blue cypress oils. Very disharmonious. I stumbled upon this disaster while working on a new project - a beard oil.